Since 1895, this world-famous salve has been lauded by fashion magazines, make-up artists, and celebrities as their number one preferred lip balm. In addition to being a wonderful lip moisturizer, natural-looking lip gloss and lipstick base, it is still a family favorite to aid in the relief of chapped and dry skin, blemishes, diaper rash, and detergent burns. * Outline lips with lip liner of you choice about ¼ inches from the outside of your lips toward the center. Then use a lip brush to blend the salve to achieve a “pouty look”. 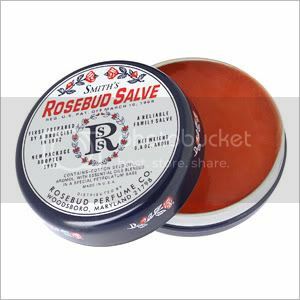 * Use Rosebud Salve alone or over your favorite hue of lipstick to moisturize and give a “dewy effect”. * Apply Rosebud Salve to eyebrows to tame an unruly brow line while also giving sheen. * Rosebud Salve is great on fly-away or frizzy hair. Dab a small amount on the palms of your hands and apply sparingly to tresses. * Use Rosebud Salve as a subtle accent to cheek bones, collar bones, shoulders, or any other body part that you want to moisturize or enhance. * Apply rosebud Salve lightly to the skin above the eye as a base for powered eye shadow, and then add the desired colors you wish to dazzle your eyes with. The rich emollient properties of the Salve will help to hold that look all day." My dad... nearly 70 years ago... sold Rosebud Salve. Our whole family uses it. Keep in mind that the Rosebud Perfume Company has increased their line to other salves and lip balms... all are excellent. I use the Rosebud Salve in a tube all the time. So impressed with the quality and uses for this product that we began selling the products nearly 5 years so. If you want to try any of the products... www.SalvesandLipBalms.com. I think you'll find them to be awesome 'stuff.' Thanks.